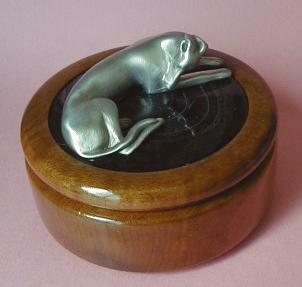 Here is a box with a solid pewter IG laying on top. It has an outer diameter of 4" and is 1.75" high (not including the IG). On the top lid there is a pure agate insert in a limited number of colors. 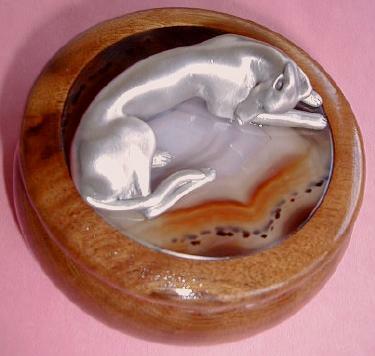 The box is of highly polished rosewood and was made in Brazil. This is a high quality collectible and quantites are very limited. Boxes vary slightly in shape, but not in size. Please specify color choice when ordering -thanks! Price is $47.00, including shipping.